A novel about identity, about identical twin sisters. Do you recognise what is fake and what is true? One sister is prettier and cleverer than the other, and she is unkind to her twin who seems downtrodden, bullied, teased and not so bright. Then a childhood prank goes wrong which affects the two girls for the rest of their lives. Helen and Ellie play a cruel trick on a neighbour, they swap clothes and re-do their hairstyles appropriately (Helen wears a plait, Ellie is in bunches) and act like the other one does – Helen assertive, Ellie cowering. It is Helen’s idea, but when it is time to swap back Ellie refuses. 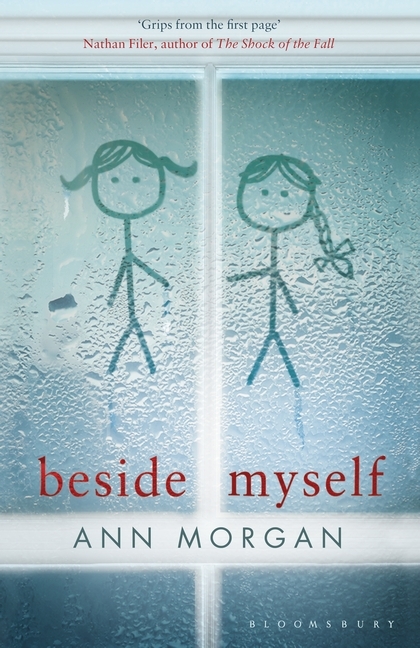 Beside Myself by Ann Morgan is thoughtful, at times creepy and disturbing. The story is told from Ellie’s point of view, that is Ellie who used to be Helen. Hellie – Ellie who became Helen – is now a TV presenter. Helen – who is now Smudge/Ellie – is struggling with mental health problems. Confused, I was a little. After the switch, both girls seem to be accepted without question by friends and family, despite their obvious personality differences. Their mother has met a new man and is not taking much notice of what her daughters do. Even so, the mother’s blindness is a little hard to believe. There is a soggy section in the middle of the book with stream-of-consciousness rambles which I could have done without. I also admit at times to pausing and double-checking which girl I was reading about. Without giving away the conclusion, it is pertinent to say there is a dramatic turning point which makes the girls revisit their childhood, the swap, and other family memories; and so as adults they make sense of who they are today. Many things are explained and, though I didn’t find either girl particularly likeable, they are much more alike than either appreciate. This is a psychological portrait of sisters, identity and mental illness, rather than a thriller so don’t expect dramatic action.